An unstoppable super-villain attacks New York City–and the Mighty Avengers fall before him! Where did Anti-Man come from? And who can stop his overwhelming rampage?! Now Iron Man races to find the only man who’s ever defeated Anti-Man–THE BLUE MARVEL…a hero the world hasn’t seen since 1961! Will Tony Stark uncover the truth behind Blue Marvel’s disappearance…and will Blue Marvel ever recover from it? Kevin Grevioux (NEW WARRIORS) and Mat Broome (The End League) join forces to create Marvel’s newest powerhouse super hero! The Mighty Avengers (Iron man, Sentry, Ms. Marvel, Yellow Jacket are getting their asses handed to them by a man in a strange costume who on the verge of killing them dissipates. 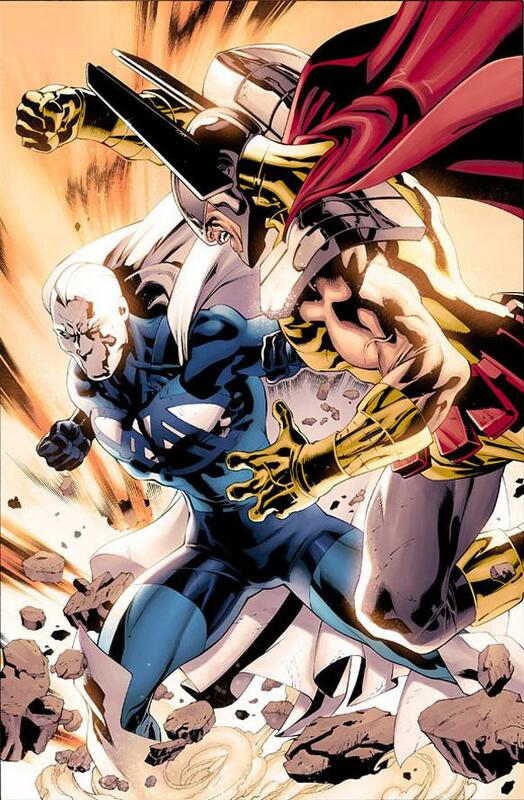 In the past we see the Blue marvel defeat Anti Man and get ousted as a black man thanks to a tattered costume. 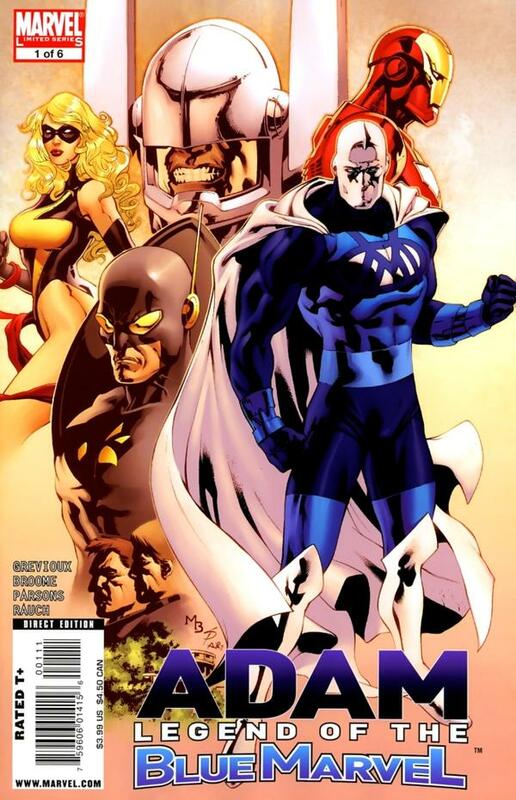 In the present the team analyzes Blue marvel extensively, who he is, his past etc. 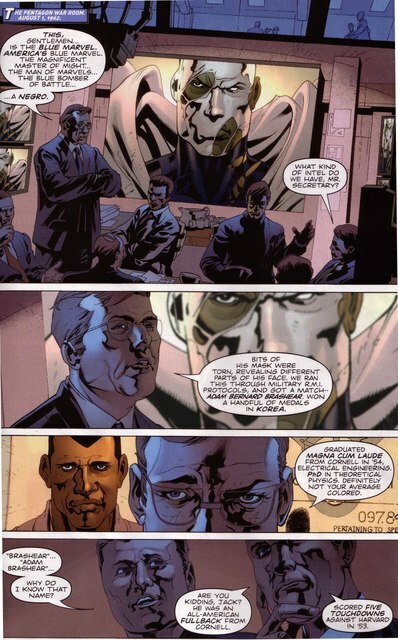 He’s called in by the president who asks him to retire the Blue marvel identity. The artist and colorists use of light and dark was particularly well down. The battle between anti-man and the mighty avengers looked well thanks to the light and dark contrast. I also enjoyed the trip back in time to “racist” America something that you can easily take for granted if you’ve never been a minority your whole life. It was also an interesting read about the retirement of the blue marvel since it will be a very polarizing event to readers. Some will think him a coward for stepping down. Other will think how patriotic he was in doing it since he could have easily “lead” his people and “inspired’ them to rise up even sooner than they did. The effects of a “black superman” on this time in America’s history would true have been “polarizing indeed”. For the first issue it showed us the gargantuan power of our hero and set things up for his return in the issues to follow. Depending on the reader Blue marvel is either a “coward” or a “hero” take your pick! Others with scoff at another “black superman/black sentry” others still have issues with the writer which will prevent them from giving the story a try. I have always wanted to know when Blue Marvels powers would be needed again. I’m digging this arc and I truly hope more fanfare comes from this old hero of yesteryear that truly belongs in the limelight again! I agree man! Time for Blue marvel to get some love!